In March 2010, The Shakespeare Birthplace Trust started to lift the turf on the site of Shakespeare’s family home. It was the start of ‘Dig for Shakespeare’, a seasonal excavation that was always about three things: to find out as much as possible about New Place when Shakespeare lived there; to engage volunteers to work with the archaeologists; and to make the dig part of the general visitors’ experience to the site. Archaeologists (now based at the Centre for Archaeology, Staffordshire University), augmented by around a hundred and twenty volunteers, were in quest of Shakespeare’s lost home. There were three main iterations of New Place. The first was the original house built by Hugh Clopton in the 1480s, and which Shakespeare purchased in 1597. Towards the turn of the eighteenth century, the New Place that Shakespeare had owned (which was still mainly Clopton’s fifteenth-century house) was demolished and an entirely new house was built on the site (by the descendants of Hugh Clopton). That ‘new’ New Place was itself demolished in 1759. Ours has led to the fullest – albeit fragmentary – picture of what Shakespeare’s New Place was like in Shakespeare’s time, its size and its layout. Not least, we discovered evidence for the large, late-medieval hall that stood in the courtyard, farthest from the main street. This was a main focal point for how people lived there, and suggests that Shakespeare had a taste for the old-fashioned, for the architecture of a former age. His house was as romantic as many of his plays. But it has long been suggested that Shakespeare, in the words of Lewis Theobald in 1733, ‘repair’d and modell’d it to his own mind’, which our dig was able to confirm. Fragments of a brick feature within the Hall suggest that Shakespeare had added an external chimney stack to it. Evidence also suggests that Shakespeare added a brand new street-frontage to the property, which included, as George Vertue noted in 1737, a long gallery. The more we uncovered, considering our finds in relation to documentary evidence and comparative architecture, the more important New Place became to our understanding of Shakespeare’s social status and career. In fact, what we have learnt about Shakespeare’s lost home is now become an undeniable part of Shakespearian biography. He wouldn’t have bought a house as grand as New Place and never spent any time there. It is likely that New Place became his writer’s retreat, removed from the competing demands of London (where he was only ever an intermittent lodger). He could, when necessary, and like other of his townsfolk, commute to and from the capital, a journey of three, possibly two days on horseback. 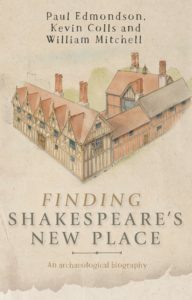 To understand more about New Place – its archaeology, its size, its reputation, and to imagine what that meant to Shakespeare and his family – is no less than to revise how we write Shakespearian biography. Since we started to lift the turf in 2010, New Place will never be the same place again. 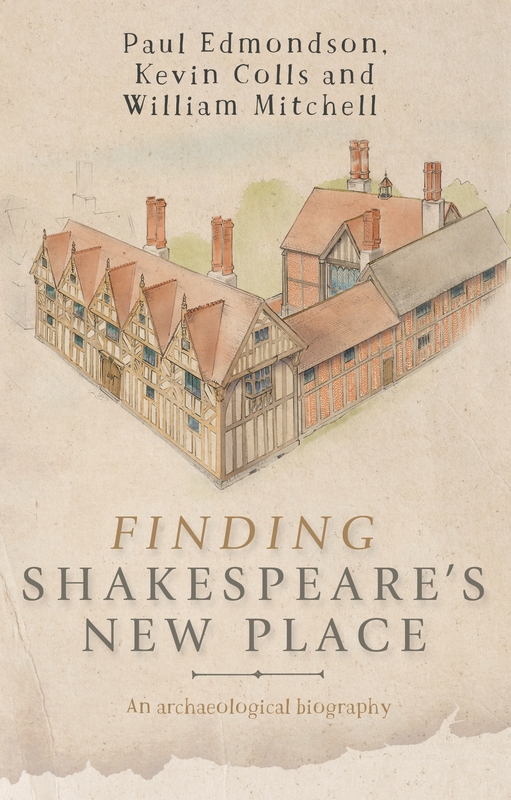 Finding Shakespeare’s New Place; an archaeological biography by Paul Edmondson, Kevin Colls and William Mitchell is now published. There is a one-day conference on Shakespeare’s New Place at the Shakespeare Centre, Stratford-upon-Avon, on Saturday 17 September. To register and find out more, please email [email protected] or buy a ticket online, here. Attendance includes a copy of the book.